There are many ways to create income from mutual funds. But there are only a few that are really safe over the long-run (which we’ll get to). Many people think that they can buy mutual funds that buy bonds or preferred stocks and that by so doing they’ll safely get the income they want. It’s true that such funds generate income but they expose investors to risks they may not be aware of. I say this because people who pile into bonds give up the potential to grow their money. They also make the mistake of locking in to today’s ridiculously low rates. That means that when interest rates rise, the value of that bond mutual fund is going to sink faster than the Titanic. That’s because as interest rates rise bond values drop. That’s just what bonds do. So if you are interested in creating safe income from mutual funds – especially growth mutual funds – there is a far better way. Let’s look at such an alternative known as systematic withdrawals. Let’s assume you have $100,000 and want to take an income check every year from your account. You’ve decided that bonds aren’t for you. You like the idea of investing in the S&P 500 because you like the long-term potential for growth. Neal’s Notes: By the way, you can also use similar techniques to get income from stocks even if they don’t pay a dividend. Can you see that the balance of your initial $100,000 is worth almost $170,000 (hypothetically) by 1991? Feels good…right? Now, if you set up your account to withdraw 4% of the balance, your income increased from $4000 a year in 1988 to more than $6700 in 1991. Sweet. That’s an increase of over 50%. And by 1999 the value of your original investment grew to more than $540,000. That means your income grew from $4000 to over $21,000. If that’s not fantastic, I don’t know what is. Sadly, the direction isn’t only up. By 2002, your account value dropped to $292,000 – enough to ruin anyone’s barbeque. And to make things worse, your income dropped from $21,000 in 1999 to $11,703 in 2002. That’s more than a 50% drop. Terrible. Of course, it’s still almost 3 times greater than the $4000 income you started getting 11 years ago but most people forget about that. They focus on the “loss” rather than the relative gain. Which would you prefer? A fixed income of $4,000 a year or one that went from $4000 to as high as $21,000 and then back “down” to $14,000? While the emotional roller coaster was greater with option 2, so was the income. While it’s nice to see your principal rise every single year – it’s not important. You aren’t spending your capital (hopefully). The income is what’s important. Am I right? It’s important to grow your capital if you want to grow your income. There is no other way to do that. And if you want to grow your capital you must accept short-term risks. If you want to create “safe” income from mutual funds you must first define “safe”. Is it more important that your income is fixed? If that’s how you define “safe” you will struggle with inflation down the line and ultimately this decision may jeopardize your financial future. I can make the case that this route is anything but “safe” over the long run. If you define “safe” as having sufficient income over the long-run you’ll turn to equity growth. The downside will be short-term fluctuation of your capital and your income. How do you define “safe” income? 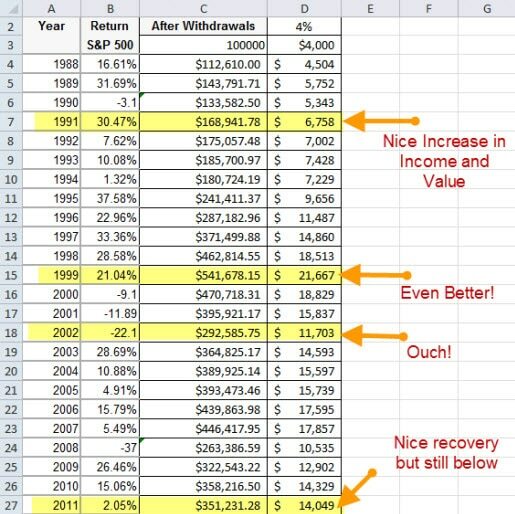 You said, “Look at column “C” and see what theoretically happens to the value of your $100,000 investment – after the market does it’s thing and after you withdraw 4% of the value of the account value at year end.” Actually, it looks like you calculated 4% of the value of the account at the beginning of the year. Example: At the beginning of the year, you calculated 4% of $112,610.00 which is $4504, let the $112,610.00 increase by 31.69% and then withdrew the $4504 leaving the account with $143,791.71. Even though you seem to have misstated how you arrived at the numbers, I like calculating the 4% at the beginning of the year so you know for a fact how much you will be withdrawing at year’s end. Nicely explained. Truly, the benefits outweigh the risks and losses. This analysis is very misleading. How about starting from 1999 with the first year a 9.1% decline and take it from there? The next 13 years leaves someone a much smaller balance for the years going forward to appreciate from at this current point and that’s if there’s much appreciation from the currently richly priced market (average p-e but with historically high profit margins). Bottom line; the results are enormously different than your rosy scenario. Steve, you make a good point but I also take issue with one statement. First, bring light to the fact that there can be extended periods of poor performance and that is important. A 10-year period isn’t a long-enough to make this work always. Sadly, I do not understand finances very well. My (new and first) broker quickly invested $100,000 I inherited from my Mom in a variable annuity last year. I just went along not knowing anything. Brokers get paid well for selling annuities. This money is as important to me as millions are to others!! I am trying to read and learn. The more I read the less I understand. But, wouldn’t it be wiser to invest this money in a mutual fund (of some sort) than an annuity? I understand annuities are expense but I get a “guaranteed” stream of income? I am currently 60 yrs old and I will have to retire in a couple of years due to poor health. The variable annuity may or may not be appropriate for you. Generally speaking, I’m not a fan. Trying reading this on variable annuities and this on a possible law suit against your agent. Just curious, what if you took the 4% from a three year moving average rather than the value of just one year. Would that even out the income somewhat? Trina, this is amazing question. I have never seen this analysis. It certainly would even things out. I don’t know about the “survivability” because it would slow the reductions down when those adjustments need to be made. Also, to be fair, it would slow the increases. I really love this idea. Great thinking! I would have to look into this further though…. Great article. Many investors don’t get the concept of income. All they understand is what they see as the balance on their statements every month. There is entirely too much focus on performance, and not enough emphasis on income. Articles like this bring that back into perspective.